Join our newsletter to learn more about our downtown and the downtowners who grow here. 1. What drew you downtown as a place to open your business? I guess I’m an old soul. Downtown Texarkana has always intrigued me. I can remember going to the original Bryce’s a time or two. I believe downtown is making a comeback, one business or property at a time. I’m glad we are here. 2. Do you have a favorite downtown moment or memory? My favorite moment since opening the office down here was when our signage went up on the outside of the building. The Downtown Neighborhood Association (Texarkana DNA) posted a picture of it on Facebook to welcome us to the neighborhood. We hadn't even moved in yet, but that's when it felt real. 3. Tell us something interesting people may not know about your building. This used to be the Gus Kennedy Shoe Store, the name still stands in the tile out front. We also really enjoy that the interior has exposed original brick and the original 20 foot ceilings. 4. What do you want people to know about your business? We're a full service agency that can handle all lines of business. Lee and I both value personal service and because of that we are very dedicated to our clients. 5. What would you like to see downtown in the future? More owner-occupied buildings. When local people invest in these properties, especially for use as their own business, they take more pride in beautifying and maintaining the property. Thank you, Mr. Sheppard! Southern Insurance Group is located at 123 E. Broad Street, open Mon - Fri 9am - 5:00pm. Follow Southern Insurance Group on Facebook to keep up with them, or visit their website at www.sigtxk.com to learn more or request a quote. I was born and raised in a small town, where everyone knows everybody. I tend to think of downtown like a small village. Big city heart, but the people and atmosphere make it quaint and cozy compared to the hustle and bustle of uptown. Some of my very first memories are of downtown. My grandmother worked at Commercial National Bank downtown for over 30 years and I got to spend many days there with her. I can remember riding up and down in the elevator for fun as a kid, and looking out the top floor windows into downtown, which was beautiful to me. 3. Tell us something interesting you've found in your building. I really love the chandeliers that are upstairs in this building. I think Amanda Horton [the previous tenant who owns the building] made them. I know she did a lot of work in this space and I just really appreciate those little details. We have many options to curb your sweet tooth; whether you are dieting or have to watch your sugar intake, to craving those double doozie buttercream filled cookie sammiches, we have you covered! We also offer cookie decorating classes every week and we book birthday parties right here in our upstairs space. It's a fun experience for all ages that's sure to make sweet memories ;). I would LOVE to see downtown continue to grow. I had this crazy dream last night that a bagel shop opened right around the corner and filled the air with the amazing aroma of delicious bagels, that would be a great addition down here! Thank you, Mrs. Graham! After her daughter was born, Emily decided to be a stay at home mom and found baking to be relaxing and challenging. In 2015 she started Graham Slam and her cookies were featured on Good Morning America in 2017. Emily recently moved in to her own space at 114 Pine Street, open Mon - Fri 9am - 5:30pm, Saturday 10am -3pm. Follow Graham Slam Bakery on Facebook and Instagram to keep up with them and see their tasty creations. I read a book about the early days of Texarkana, The Southern Timberman, about William Buchanan, and really admired what it took to build the town. It was built by people with visions who didn't mind hard work, they started from zero. I like the idea of being a part of that, being a part of history. As a kid I would come downtown to shop at Buhrman Pharr with my dad and my grandfather. You placed your order at the counter then went over to another spot where your packages would come down a slide from the upper floors. I always wanted to go down that slide. 3. Tell us something interesting that everyone might not know about your building. Well, this building was Bolls Distributing throughout the 70s, a beer distributor, and a lot of people have probably heard about the connection with the movie Smokey and the Bandit. It wasn't until after I purchased the building that I learned it wasn't in the movie at all. Not even a cameo. One other thing I learned from Mr. Bolls is that he was just a few thousand thirty packs away from having sold a million of them. I think that stone is timeless. I recently got to go to Brazil and see firsthand the quarries where our stone is mined. To be able to enjoy something in your home that came straight from the Earth like that is awe-inspiring. Things that nature creates never go out of style. I would like to see it be the bustling part of town that it once was, see the legacy of the men who laid the original city blocks be honored. The interstate is great, I use it every day, but to come downtown feels like getting back to our roots. Thank you, Mr. Hughes! Dustin also owns Contemporary Concepts, a commercial cabinetry mill located downtown on Lelia St. since 2009. In 2016 the company expanded their stone capabilities and started Stone Studio by CCI, servicing residential clients as well as commercial with granite, marble and quartz. Dustin and his team are currently renovating their 22,000 sq ft space at 700 East Broad. Follow Stone Studio on Facebook to keep up with them or check out their website. Stop by the showroom Monday through Friday from 9am to 5:30pm to see their beautiful space and wonderful selection of natural stone. Questions like these make me feel so old. Remember the Quadrangle Festival? (If you do, you are definitely a Texarkana OG and were probably born at Wadley.) I remember walking the streets of downtown and being so fascinated by the beautiful buildings. The character. The beautiful details. The history. Oh, where do I begin. Can I talk about the illegal trespassing I did here? I will preface with this, don’t trespass. Aside from being illegal, some of the buildings are old and dangerous. However, when I was a teenager I snuck into the old train station. I will never forget it. Through the dust and dirt all I could see was the craftsmanship and beauty. It looked like a ballroom that had been forgotten. My building was an old full-service gas station and garage. It amazes me the details of the building. Even though it has seen better days, the ceiling in the space I use for my office is beautiful! Why don’t we do tile ceilings anymore? Absolutely gorgeous! The bathroom is also tiled and I can’t tell you how many times I’ve had people come out of there and say, “oh, my goodness! That bathroom reminds me of my great grandmother’s bathroom!” It’s green tile and it’s a huge hit (and easy to clean, I might add). You know the large albums that have been passed down in your family? Or maybe you have a shoebox filled with old photos of loved ones? If I were to offer to buy them from you, would you sell them? How much? Of course you wouldn’t! They’re priceless. It’s your family legacy. While I’m known for my photography, I’m here to help you preserve your family legacy in a digital world. I’ve heard the story many times and maybe you can relate- I lost my phone and with that I also lost all the baby pictures of my son. I lost 1 of my CDs with my wedding photos on them and they are gone forever (that’s my story, btw.) My computer crashed and the photos of my children’s childhood were on there. Gone. Forever. I’m here to help stop that from happening. To preserve your family legacy. I offer my clients heirloom quality prints, wall art and albums that are built to stand the test of time and be passed down for generations. While, yes, we take photos for ourselves, we are also taking them for generations to come to enjoy. It’s your family history. Let’s preserve it together. The beautiful thing about downtown is that it has such a wonderful past AND has potential for an amazing future. It’s no secret our world is changing thanks to technology (and I’m not complaining. I’ve been a proud Amazon Prime member for years!) But I think we can all agree that there is a certain comfort and entertainment that come with actually going to the store. I would love for the streets to be filled again with shoppers. Have a local baker who specializes in the art of the cookie on Wood Street. An amazing coffee shop off 3rd that I could walk to from my studio. A gift store on Main where they sell Le Creuset cookwear and have the best window display... especially at Christmas. Ok, I’ve obviously thought about this a lot. But it’s far from impossible. I encourage business owners to take a look at our town’s historical stores with eyes on the future. Thank you, Mrs. Brint! 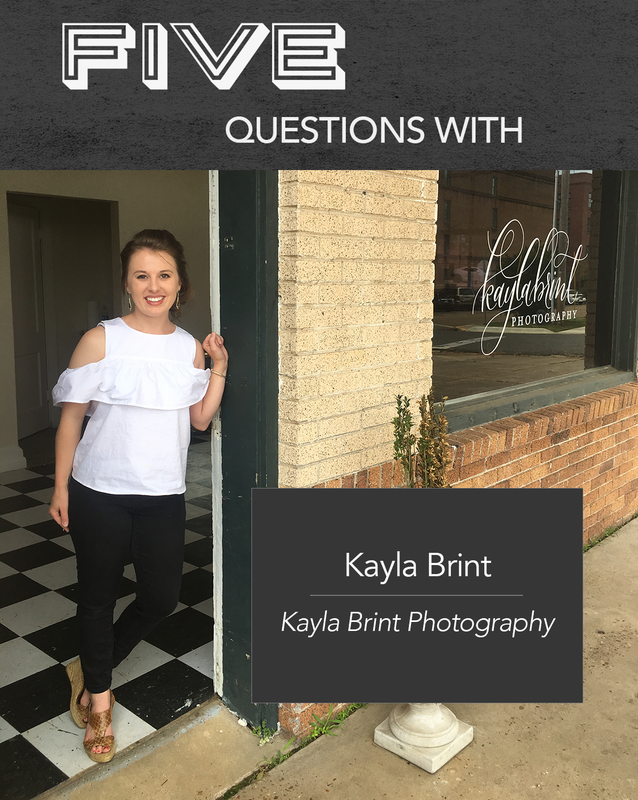 Kayla Brint owns Kayla Brint Photography and has a studio located at 523 E Third St in downtown Texarkana, AR. Follow Kayla Brint on Facebook and on Instagram to keep up with Kayla or check out her website and weekly blog at Kayla Brint Photography. I'm from Texarkana and I grew up coming downtown to go to M&M Antiques. I moved to Houston for a few years and when I came back to Texarkana I really felt that we needed a little more "weird and quirky" downtown, and my idea for a shop was exactly that. I didn't think it would work anywhere but downtown. Working with Dr. Rowe [who owns the Lindsey Railroad Museum and Old Town] to source things for Old Town has been a really fun experience. She came in one day and said, "I need anything 1890s! ", so I had that on my mind. The next day someone came in and brought me an 1890s-era dress - just gave it to me as a gift. That felt serendipitous, and then I began to find other things. 3. What is the most interesting thing that you've come across looking for items for your shop? Oh that's easy, the most bizarre thing I've seen was a 1930s electroshock therapy machine that was made in Texarkana. I initially thought it was a radio, it was inside of a case, but once I started looking at it more closely it had some sort of modified Tesla motor and a bulb that mimicked a Tesla coil. I had some museum contacts from my time in Houston, so I reached out to a museum in New York and described the object in an email. They asked, "Are you in Texarkana?" Turns out there was a man here who invented these and went door-to-door selling them as electroshock therapy machines to be used in your home. He ended up going to jail for fraud. We are here to bring antiques back to Texarkana and to find them good homes. We are a quirky store, we do things our own way and make our own rules. We're a fun place to shop. More unique and different businesses downtown. This neighborhood, and especially our block, has some awesome businesses and a great community feel, and I would love to see it continue to grow. Thank you, Ms. Lewis! 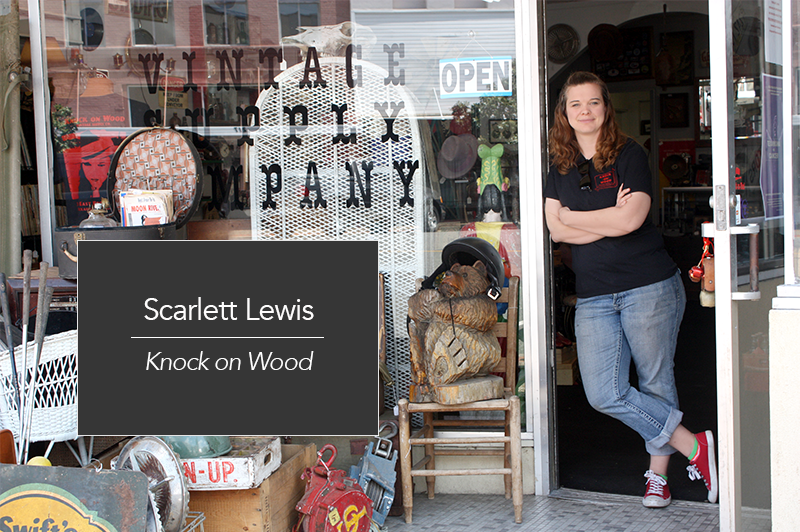 Scarlett Lewis owns Knock on Wood Vintage Supply Co, located at 216 E Broad St in downtown Texarkana, AR. Follow Knock on Woodon Facebook and on Instagram to keep up with Scarlett's latest finds! Or stop in and check out her store Wed - Sat from 11-5. Want to see more photos? Check out our blog! 1. How long has your business been open and what drew you to downtown? My Partner, Dace Jones, and I actually got the opportunity to buy the building - The old Roy D. Hopkins Feed Store - and didn't know what we would do with it, we just thought it was a really cool opportunity and decided to go for it. We brainstormed for a while and decided on the Icehouse and restaurant concept. After we bought the building, Dave and I did most of the remodeling work ourselves over about 18 months. We had a grill outside and a little 25-inch TV. On the weekends our friends would show up and just hang out while we were working. We had some really fun times then, before the place even opened. 3. Can you tell us something interesting you've found in your building? Well we have an old refrigerator that belonged to the feed store that still works, it's right over there [ at the end of the bar]. One day we were down here working and took a hammer and broke through the plaster and saw some brick. We eventually uncovered the entire wall and you can see it's all brick and was in great condition. These are the original ceilings as well. It's been almost a year since we went smoke-free. We just knew we needed to keep up with the times and with teh demand of our local community, and it's really been a positive thing for us. We've seen food sales increase, we do a great brunch on Sundays. More people giving downtown the opportunity to earn their business. We have seven restaurants downtown, which is so great. I see people every weekend who park here and walk to Zapata's or Verona or Pecan Point for dinner, then walk back here and get to enjoy another place, maybe have a nightcap or listen to some music. It's awesome that we have that in our downtown, that people can have more than one destination on a date night or a girls' night. There are a lot of great experiences downtown, Knock on Wood, the new Gallery at 1894 City Market, and everything downtown is locally owned. Thank you, Mr. Dodson! 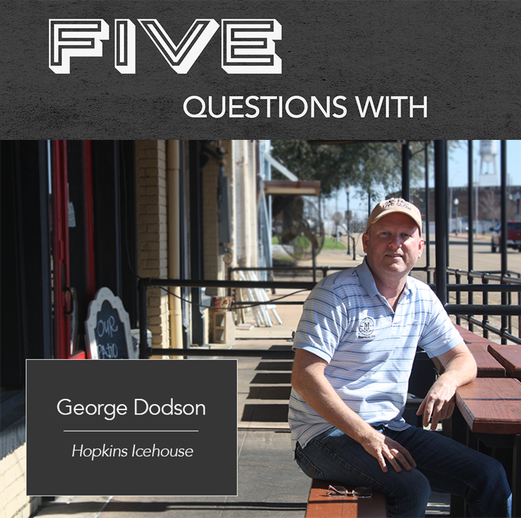 George Dodson and Dave Jones own Hopkins Icehouse, located at 301 E Third St in downtown Texarkana, and now a second location on Gibson Lane. More information, including menus can be found at hopkinsicehouse.com. You can also keep up with them via Facebook. 1. 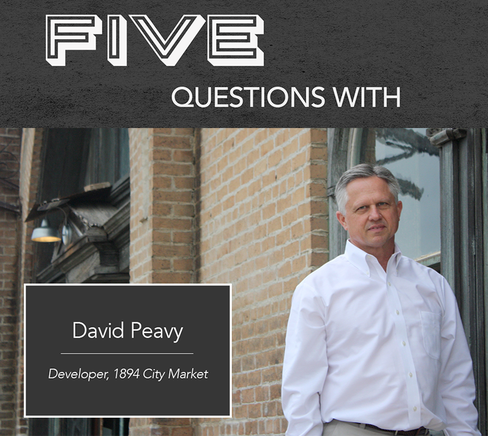 How long have you been in Texarkana & what drew you to downtown as a place to move your business? My family has been in Texarkana since July 2000, when we relocated from Greenville, Texas due to a promotion from a previous company. 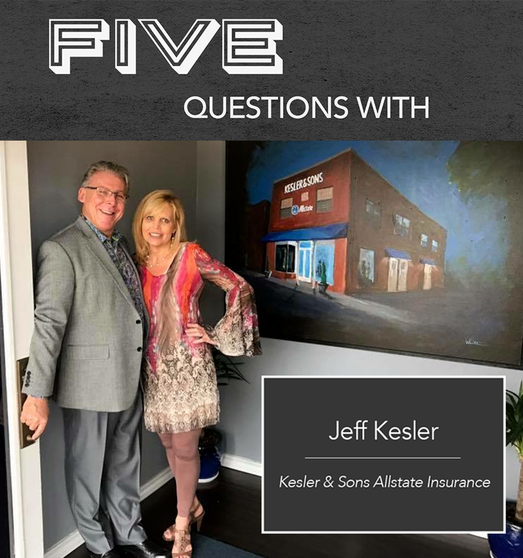 I had been thinking about relocating Kesler and Sons Allstate for a couple of years, we were beginning to outgrow our location and I wanted a place we could really call our own. As soon as I saw the real estate listing, I knew 515 Main Street was the perfect place to relocate. That same day I signed a contract to purchase the building. I believe the year was 2005, my sons (Caleb and Caden) and I entered the Battle of the Bands at the annual Quadrangle Festival, they were 10 and 15 years old at the time. We won 1st place that day, which led to many other music engagements for the Kesler Brothers, including Jump Jive and Jame Fest, the watermelon Festival, the T Bone Walker Blues Fest, Grapefest, and several other venues. 3. Can you tell us something interesting you've found in your buildings? It is my understanding that the upstairs portion of the building used to be the Carpenters Union Hall. Their is an emblem on the storefront of the building with the Carpenters emblem. Many people think it is a masonic lodge emblem, but it is indeed, a Carpenters Union emblem. The first floor of the building was an architect's office from what I've been told. In an effort to maintain the historical aspect of the building, we've lined the wall with vintage Texarkana photographs. Clients love to come in and take a trip down memory lane. Some of our photos date back to the early 1900s. We have a warm, professional, and spacious office with a conference room and an extra office for privacy, if needed. Above all, I would like folks to know that we are here to serve the public with their insurable needs, and I am so proud to have the staff that represents Kesler & Son's. I couldn't ask for a better support staff than what I have with Caleb, Caden, Jessica, and Doug. I am blessed to have great people representing our agency with my name associated with it. Growth, growth, and more growth. I am proud to be downtown. Although downtown is older, it has a vibe to it that northern Texarkana just doesn't have. North of !-30 seems to be hustle and bustle. I think downtown is more laid back, less traffic. Fast food restaurants are not found, but great atmosphere restaurants and great food is what will be found if you visit downtown. Also, the loft apartments are growing downtown and I look for that to continue to expand. 1. What drew you to downtown as a place to start a huge project like this? I used to run the market on State Line behind Naaman's Barbecue. Ina McDowell approached me about possibly moving it downtown. When I started looking around at spaces, this building stood out because of its proximity to the Front Street Festival Plaza. Its a landmark building, I think its probably the most photographed building in Texarkana. It will be a great anchor to events, to have something else down here that is open to the public. Everyone can remember walking through the streets, window shopping, etc. Instead of recreating downtown the way it was, I want to see downtown become a different downtown, a new place, where new memories are being made. Investing in creating a place where that happens is what excites me. We have a case of artifacts on the ground floor, in what will become the gallery space, all of which were found in the attic. There is also writing on the wall in twp places done by a man named Tom, his first note is dated 1910 and the second 1919. 4. What do you want people to know about your building? Ritchie Grocery [now 1894 City Market] is ranked #6 on Trip Advisor in Places to See in Texarkana, Arkansas. People come here to take pictures all the time and I encourage people to continue to do so, I think it's great. I hope that it becomes a place that people are even more excited to come to, a true destination in downtown Texarkana. 5. What do you for downtown's future? Right now I think that the stars have really aligned for downtown. I used to drive around and notice all the empty buildings, now I'm seeing all of the full buildings. There are definitely still spaces available, but things are falling in place. 1. How long have you been in Texarkana and what drew you to downtown as a place to open your business? The gallery has been open here on Broad Street for close to 3 years. I've been in Texarkana for almost 70 years. I retired as an art teacher and have always tried to stay involved with the community, through TRAHC and other ways. Being an artist has always come secondary to teaching. I knew I wasn't ready to just sit in a rocking chair, so when this building came available it was just a dream, and I partnered with four other people and we opened the space. The history down here and the connection that you feel to that history and to the people that's what I love about being downtown. As a teenage, I remember coming downtown to have cream horns at City Bakery, then we would for cherry cokes at Simmons Drugstore and go see a movie, that was our entertainment and it was so much fun, walking around. 3. Can you tell us something interesting about your building? From what I understand, the original brick here was handmade and layed out to dry on Broad Street. It's amazing to think of the labor that went into these buildings, everything done manually - carried and moved without the machinery we have today. The fact that these buildings are still standing, all the people who have walked through them, I love that connection to history. In addition to displaying and selling art from local artist, we also offer classes and workshops. We have hosted private parties and we can do small group classes, like a ladies night out. We're very community-minded, we work with local nonprofits, we want to give back to the community as much as we can. I would like it to really become a hub for artist of all kinds, we are in the Arts and Historic District. Also to see more specialty shops come back and just see all of the empty buildings utilized. All of neighbor shops- Knock on Wood, Verona Italian Restaurant, the Phelps at Logan electric, are just great - we are a community down here. Its a great place to be. 1. 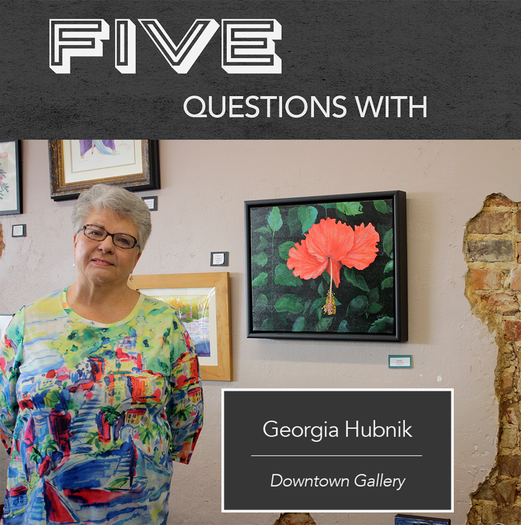 How long have you worked in downtown Texarkana? I have worked downtown for the Gazette for 35 years. I'm from Texarkana, though, and both of my parents owned businesses downtown, one on Broad Street and one on Third Street. As a boy I was down here everyday after school, so i have almost 60 years of history with downtown. 2. When the Gazette was looking for a new office to move into, were there ever any locations on the table that weren't downtown? Yes, we looked at several properties that weren't downtown. One factor for us was the traffic that we have each day, we have over 90 employees and over 100 newspaper carriers that come each night to get the papers to distribute, plus people from the community come in to place classified ads, drop off church bulletin news, etc. We wanted to remain where they could easily get to us. And while we don't have to be near our production facility, it is nice to be close. We feel optimistic about the new businesses opening or moving downtown and the Texarkana Gazette is looking forward to continuing to be a part of that downtown growth. 3. Do you have a favorite downtown moment or memory? As a boy I loved to fish. My favorite place to was Timberlake Hardware, which used to be on Main Street, to buy fishing tackle. The owner, James Timberlake, knew me and I could walk around downtown, as an 11 or 12 year old, and visit different places. We all knew each other, there was a real sense of community downtown ant that time. 4. Can you tell us anything interesting you've found in your building? Well, the old building that still houses our production equipment, on Pine Street, used to be a Studebaker dealership years ago. Upstairs, you can still see mes' names painted on the walls where the mechanics for the dealership had their lockers. 5. What do you want people to know about your business? Newspapers are alive and doing well. We're reinventing ourselves and instead of just delivering the print paper everyone thinks of, we deliver the news to tablets, mobile devices and desktop computers as well. We have more readers now than ever. We're the only business that I know of that creates a new product, and gets it out, on a daily basis. 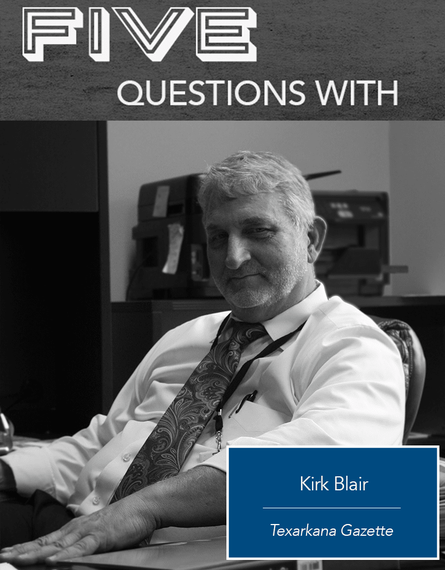 Thank you Mr. Blair! You can keep up with the Gazette online through their website TexarkanaGazette.com or by following them on Facebook @TexarkanaGAzette and Instagram @texarkana_gazette.